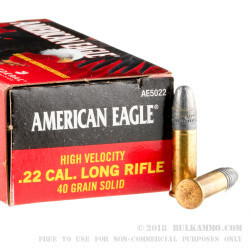 For a fun day at the range that won’t break the bank, you can’t beat the .22LR rimfire cartridge. 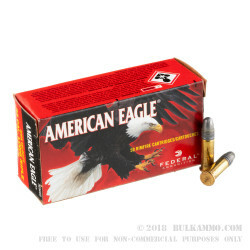 American Eagle rimfire ammo by Federal Premium Ammunition offers a strong value for high-volume shooters. The round’s solid accuracy and minimal recoil also make it ideal for training a new shooter to handle a firearm safely and effectively. This rimfire-primed, brass-cased ammunition propels 40-grain .22LR lead round nose bullet at a muzzle velocity of 1240 feet per second. It is suitable for use in revolvers, bolt-action rifles, autoloading rifles and pistols. 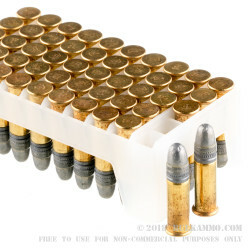 In business since 1922, Federal Premium Ammunition of Anoka, Minnesota manufactures ammunition for the US military and the civilian market alike. 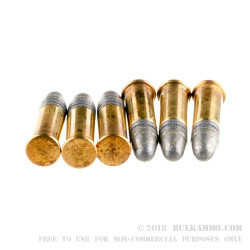 The company’s diversified product line includes self-defense, hunting, and range ammo; its rimfire offerings are among the most popular on the market due to their strong reputation for accuracy, reliability, and reasonable price.